Hump Day Report: Romney/Ryan, America’s Comeback Team! And on the day Ryan was picked, it’s worth pointing out that we’ve gone 1200 days now without a budget. Matt Lewis: 5 notable points about Paul Ryan’s selection as Romney’s running mate. And here’s how the Dem machine is planning to attack Ryan. He Isn’t Stupid so He Must Be Evil “Paul Ryan murders puppies and kittens. The lifelong Green Bay Packers fan then uses the dead animal carcasses for field goal practice. Harry Reid has an anonymous source named Fareed Zakaria who stole from somebody a column proving that Paul Ryan then sold the dead animal skins and never declared the income on his taxes for the past ten years.” Good stuff!!!! GOD BLESS AMERICA – PASS THIS ON – REMEMBER IN NOVEMBER – 86 DAYS AND COUNTING!! I think the debate are going to be the political equivalent of ‘Shock and Awe’ Ryan would wipe the floor with almost anybody, given even slightly fair questions, and Romney has no excuses, either, this is where our primary battles pay off. he’s not even close to the guy that started running. It’s going to be fun, I think but, look out for all the exploding heads!! 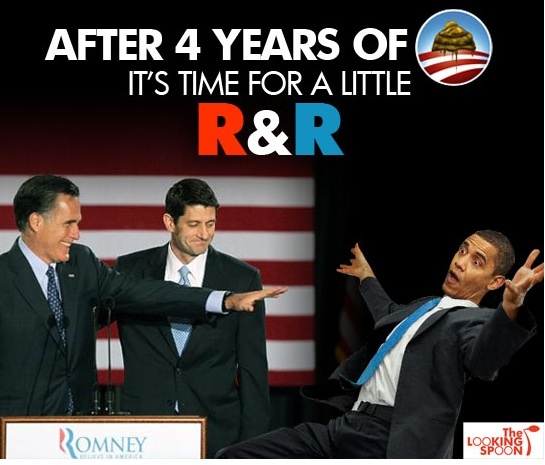 Suppose there is any signifigance in have R & R running? Will Ronnie’s ghost be helping? And I like the symbolism of the USS Wisconsin, a sign of America’s exceptional power, and assertive foreign policy.